For many people with dementia, getting the support necessary to promote optimal quality of life while living alone at home can be a challenge. That’s where Music & Memory® has made a major difference for a homecare company in Ohio. Home Care Assistance of Cincinnati (HCA), an in-home senior care service providing personal care and lifestyle assistance to the elderly in the Cincinnati area, is sold on integrating Music & Memory into their clients’ care plans. Known for the quality of their care, HCA specializes in live-in care, which allows older adults to age in place at home. “We are there to make their day more enjoyable and comfortable,” Will says. What better way to do that than to add some music to the mix? So in the spring of 2017, HCA signed up for MUSIC & MEMORY® Certification and launched a pilot program, bringing personalized music to seven of their clients living with dementia at home. Working together with families’ input, staff created the clients’ personalized playlists, and caregivers used the digital music devices loaded with their clients’ favorite music on their daily visits. The results were impressive. 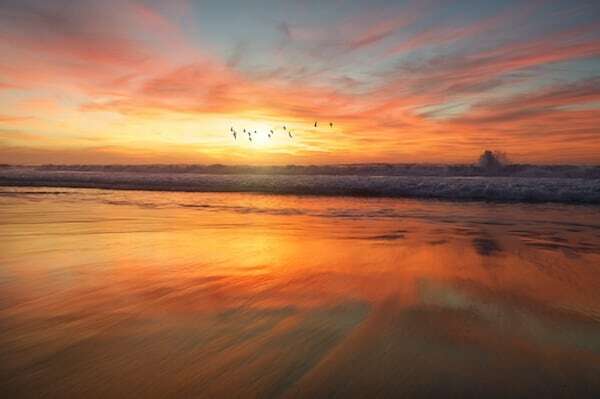 For six of the seven clients, listening to their personalized playlists prevented sundowning and reduced anxiety, particularly at night or during stressful times of the day. Each time they listened to their playlist, the joy of hearing their favorite, familiar tunes improved their mood. Better yet were the unexpected positive results for the caregivers. Music & Memory not only made their jobs easier, but was just plain fun. Caregivers loved listening to music with their clients and enjoyed strengthened relationships, bonding over fond memories and stories. During the pilot, they were eager to learn what was or wasn’t working well and made necessary adjustments. When one client wasn’t enjoying listening to music with headphones, her caregiver came up with a creative alternative. She knew that the client loved being on the computer, so she replicated her playlist in Youtube and played it in the background. The client could comfortably enjoy her playlist while using the computer independently. “It made her life that much better. If it makes anything more enjoyable, we have to do it,” Will says. Families enjoyed the music, too. They appreciated Music & Memory’s reliability and accessibility; Home Care Assistance has even encouraged families to use the music devices on their own time to keep the positive effects going. “It’s like a domino effect,” Will explains. Caregivers, clients and families all benefit. Months later, six pilot participants are still using Music & Memory and benefitting from access to personalized music. Buoyed by that success, Home Care Assistance Cincinnati plans to offer Music & Memory to all clients, not just those with dementia. “Originally we wanted to roll it out to only clients that have some form of dementia, because we felt it could have the most impact in that group,” Will says. 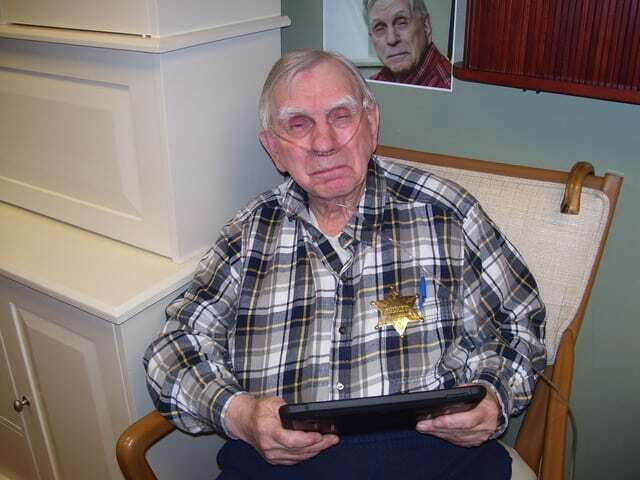 Oneida Long Term Care residents can travel the virtual world with digital tablets. Oneida County Long Term Care may have only 32 beds, but that hasn’t stopped Cindy Dawson from dreaming big. In charge of medical data systems for the small skilled nursing facility, located 13 miles north of the Utah border in Malad, Idaho, Cindy wanted to take a giant step beyond Oneida’s MUSIC & MEMORY® personalized music program to bring other forms of technology-based mental and emotional stimulation to residents. So, she applied for a $50,000 CMP grant to expand access to technology. Her case was clearly persuasive, because the full request was awarded in January 2016, enabling Oneida to purchase smart TVs for every room, even a digital baby grand piano, among other items, as well as a new wireless network for their residential building. How did she pull off such a large grant for such a small care setting? “Because I said I could,” says Cindy. Thanks to her efforts, Oneida also received a grant from Music & Memory for several digital tablets in April 2016. In addition, they participated this past summer in a Music & Memory pilot program to test digital tablet applications in nursing homes, funded by a generous grant from the Consumer Technology Association Foundation (CTAF). That can-do attitude has enabled Oneida residents to regain a sense of personal agency. Tablets have reopened a window to the world via the Internet. One resident, a Native American man originally from New Mexico, listens to Navajo news and virtually attends powwows. Another resident was able to participate in a funeral for her twin sister via Skype. A third, who is 102, uses her tablet to shop with money that her son gives her on a debit card; recently she purchased a wedding gift for family in England. The tablets have also provided an important intervention for individuals with dementia. “If someone has problems remembering things or is in the middle of an ‘escape,’ trying to leave the facility, we’ll take it to them and say, ‘Oh, look at this,’ whatever their favorite thing is,” says Cindy. The distraction can calm and redirect the individual. Other residents use the tablets to listen to music, or to virtually attend religious services or conferences. Some volunteers whom Cindy trains to conduct oral histories have used the tablets to collect family information and upload details as well as scanned photos to oral history websites. That’s not to say that every resident at Oneida wants access to a tablet. Says Cindy, “We meet them where they’re at.” For some, that means listening to music on a cassette; for others, using a CD player. But experience has taught her that everyone can adapt to new technology at their own pace. Digital music devices loaded with personalized playlists remain popular, with powerful results. One resident, who was totally uncommunicative, came to Oneida heavily medicated on five drugs. Cindy was convinced that the medications were affecting her behavior and worked with staff to reduce them, while offering her a personalized playlist. The woman is now down to reduced dosage on one medication, and Cindy expects her to no longer need it at all. Residents can attend events, speak face-to-face with distant family or friends, visit favorite places, learn more and feel a stronger connection to the outside world. In addition, the technology’s visible benefits have inspired about a half-dozen families to buy tablets for their family members, and two residents now own their own laptops. “We’re using technology everywhere you turn,” says Cindy. Innovations include smart TVs in every room (most are doubles) that are loaded with roommates’ individual playlists and family photos, so that each can watch a personalized music slideshow on the TV. There are also smart TVs for the day room, family room and hallways, all with Internet access. Programming includes images from around the world accompanied by calming music, YouTube videos, and individual’s playlists, which are stored on thumb drives. Residents use wireless headsets to avoid accidents with tangled cords. These shifts are in keeping with leadership’s belief that residents should feel at home at Oneida. Personalized playlists were the first step toward empowerment. “Tablets open up a huge world,” adds Cindy. “Technology makes them feel that they can still do things, and when you can still do things, you can still learn things, your mind is still stimulated. Because you’re stimulated, you start taking control of your life. You have initiative. For seniors at Long Island’s Sid Jacobson Jewish Community Center, it was a morning full of reminiscing. Old standards, movie-musicals and folk songs inspired animated conversation and even brought back some fond memories. 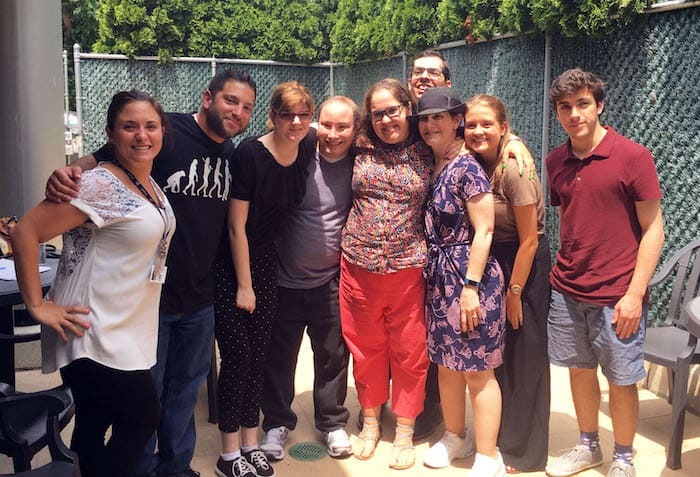 But what made this morning even more special were the facilitators of the MUSIC & MEMORY® program: five young adults from the JCC’s Special Needs Department. Alex, Stephen, Bridget, Jackie and Christie helped reveal the musical tastes and old favorites to build the basis for the seniors’ personalized playlists. Located in East Hills, N.Y., Sid Jacobson JCC offers programs for a wide range of participants. The Adult Day Programs are designed to promote social and physical stimulation for all ages and stages of dementia and other conditions. The JCC’s Music & Memory program, sponsored by Goidel Law Group, has seen impressive results. After being awarded an internal grant to expand the creative arts programming in their Adult Day Programs and Special Needs Departments, staff decided to team up to facilitate this special joint initiative. The young adults with special needs acted as “music detectives” to discover the seniors’ musical tastes, which is an important first step in the Music & Memory process. “We knew that they possessed the skills needed to interview the seniors effectively,” Joe said. Before interviewing the Adult Day Program participants, the young adults took part in an interactive training led by Joe along with Taylor Herbert, LCSW, Director of Specialized Senior Services. The training helped them gain an understanding of dementia and communication strategies, as well as the benefits of a customized iPod playlist. The group learned how personalized music can tap into long-term memories and improve quality of life. To prepare for interviewing the seniors, the young adults role-played with each other to practice effective communication skills, including speaking clearly and slowly, using eye contact and validating responses by repeating and reframing answers. They also learned how to interpret responses to music—reading verbal and non-verbal reactions, such as laughing, looking up or smiling, that indicate a positive response to music. Soon it was time to put the newly acquired information to good use by meeting and interviewing the seniors. After brief introductions, Joe played a variety of songs, from classical to early Rock & Roll, on the piano. The young adults noted the seniors’ verbal and non-verbal cues. They saw firsthand how the right music can breathe “new life” into someone, previously quiet and introverted, who began clapping, singing along or even dancing. Next, the young adults used Music & Memory questionnaires to gather more detailed information from the seniors. They asked questions such as, “Where did you grow up?” and “Who was your favorite performer or band?” Before long, Alex, Stephen, Bridget, Jackie and Christie had the seniors engaged and bolstered by music and conversation. Some of the seniors who struggled with language came out of their shells and opened up to the young adults. The room was filled with a palpable, undeniable magic. Working with the seniors was an effective confidence- and skill-building activity for the young adults. “This model encapsulates improved self-esteem and self-determination for those with differing abilities,” Robin Lombardo, Music & Memory’s Northeast Regional Director, said. Bonding over music also creates an intergenerational activity that forges connections between young and old. “It really provides an enjoyable moment of music sharing and story collaboration,” Robin added. Sid Jacobson JCC continues to expand their Music & Memory program by offering service for caregivers at home in neighboring communities. Caregivers can contact the Music & Memory Hub at Sid Jacobson JCC to create playlists for their loved ones with the help of skilled employees and volunteers. It’s that time of year again! The annual Broadway Alzheimer’s iPod Drive is in full swing and will run until August 19th. Inspired by Music & Memory, Dave Roth, Broadway musician and Alzheimer’s advocate, has teamed up with CaringKind NYC to collect new and used iPods. Now in its sixth year, the iPod drive has collected hundreds of iPods and increased Alzheimer’s awareness throughout the Broadway community. Broadway performers have shown their support, too; Kristin Chenoweth, Jonathan Groff and the cast of Aladdin and Cats call for donations in the video above. Dave knows firsthand how access to personalized music can change lives. After his mother lost her ability to communicate due to Alzheimer’s disease, favorite music provided an opportunity for the two to bond together. This year, in addition to collecting iPods, Dave is welcoming monetary donations. You may mention “Broadway Alzheimer’s iPod Drive” in the “In Memory Of” Section of the online donation form. For more information on the Broadway Alzheimer’s iPod Drive, as well as a list of drop-off locations, check out the official Facebook page. A spry woman who danced to Big Band music at her 90th birthday bash, Betty Reed was a powerhouse. A loyal Purdue alumna and lifelong fan of their women’s basketball team, Betty was, among her many accomplishments, one of the first women to enlist with the US Coast Guard SPARS during World War II; an Indiana farm wife and mother of three who helped her husband manage their 600 acres of corn, soybeans, wheat and livestock; and a well-read librarian until she retired at 75. “She was my first teacher,” says her eldest, Forrest Reed. “Thanks to her, I was high school valedictorian.” Betty loved music, a passion she shared with her children. “Mom played a lot of records and we sang along,” he recalls. She also encouraged his musical talent playing the drums and piano. Forrest built his career in marketing and broadcasting, with the music industry at its core, and settled in Sacramento, Cal. But he always remained close to his mother. When Alzheimer’s and ensuing weakness led to a series of falls, culminating in Betty’s hospitalization for a broken femur in January 2016, Forrest flew back to Indiana to take the caregiving load off his sister, Susan. For the next six weeks, he visited his mother daily in rehab. “It was the most time I’d spent with her in 35 years,” he says. Having learned of Music & Memory from seeing Alive Inside, Forrest set out to make his mother a playlist of her favorite music: Sinatra, Tony Bennett, Glenn Miller, Willie Nelson’s Stardust album, to name a few. Listening together on her iPod via a splitter, they would sing along, holding hands. “We shared photo albums from the ’40s, ’50s, ’60s, so many family pictures. I’d pull out the World War II book and she’d share all the personal stories,” says Forrest. They watched the NCAA March Madness tournaments together. Betty sang her favorite tune, “I Love You a Bushel and a Peck,” to all her caregivers. Finally, Forrest had to fly back home to Sacramento. “I said to my sister, ‘Mom is just really tired. Her time is imminent.’” He left on a Saturday. Susan took off work that Monday, April 18, to visit. Betty didn’t feel much like eating, but she wanted to sing, so Susan sang her the Purdue fight song, “Hail Purdue.” It was the last thing that Betty heard. In that moment, she died of a heart attack. She was 93. To honor his mother’s memory and spread the benefits of Music & Memory near his home in Sacramento, Forrest—who has been organizing top-flight benefit concerts since 1993—co-produced a July 2016 jazz concert that raised $18,500. That money has helped three MUSIC & MEMORY® Certified Care Organizations in and around Sacramento to double their existing programs—Revere Court Memory Care, Support for Home and ACC Care Center. In addition, the revenue helped another eight memory care communities to gain certification and provided their start-up equipment: Sunrise Senior Living of Sacramento, Carmichael, Fair Oaks and Rocklin; SRG Senior Living at River’s Edge, Sacramento; Sierra Ridge Memory Care in Auburn, Cal. ; Brookdale Elk Grove, Cal. ; and The Hearth at Tudor Gardens, Zionsville, Ind. Hospice care takes many forms—medical care, pain management, support therapies, compassionate attention to emotional and spiritual needs—in a variety of settings, from home to residential hospices, from nursing homes to hospitals. But there is one quality that all hospices share: a commitment to ensuring quality of life for the patient and support for his or her loved ones, as well. Beloved music can play a significant role in that mix. That’s the experience of Barnabas Health Hospice in West Orange, New Jersey, which has been offering Music & Memory’s personalized music program for the past three-and-a-half years. One of the first hospices to become a MUSIC & MEMORY® Certified Care Organization, with original grant funding from the Healthcare Foundation of New Jersey, Barnabas Health Hospice now extends its personalized music program to include two satellite offices in the southern part of the state. About 300 people, both in home hospice and in nursing home settings, have been able to enjoy their favorite music, easing their end-of-life journeys. Mary Murray, a registered nurse and former clinical educator for Barnabas Health Hospice, was instrumental in setting up and running the program until this past December. She recalls one of the first patients to experience Music & Memory, a man living in a nursing home whose dementia was beginning to limit his ability to communicate. That experience is but one of many stories gathered over the years by Barnabas Health Hospice staff. The positive benefits for patients have been matched by the boost that Music & Memory has given to families, as well. Pioneering the program in a hospice setting brought challenges, especially since Barnabas Health Hospice serves patients both at home and in nursing homes. A volunteer coordinator was hired to manage the program, with hospice volunteers creating playlists and delivering the iPods to patients. “We have about 150 iPods out at the moment,” says Volunteer Coordinator Leigh Conforti, who manages more than 140 volunteers. Requests for the iPods can come from a variety of sources—social workers, nurse managers or the volunteers themselves. Typically, the volunteers do the detective work of learning about the individual’s favorite music and create the playlists. They also deliver the equipment—an iPod, headphones, playlist and instructions—in a special bag sewn by another volunteer, and help the patient and family learn how to use the music. Not only is the program enthusiastically embraced by Barnabas Health Hospice volunteers; Conforti says it also is “the perfect way for volunteers to get in patient hours.” Medicare requires that five percent of hospice volunteer time be dedicated to working directly with patients. Murray says that Barnabas Health Hospice made a conscious decision to expand the program to all hospice patients, not just those diagnosed with dementia. They provide a stamped return envelope with the iPod, so that it can be re-used when no longer needed. In addition, upon a patient’s death, the Volunteer Coordinator will make a condolence call and sensitively worded request to return the equipment so that it can be refreshed for another patient. In 2016, Barnabas Health Hospice became part of a joint venture, through a partnership with the VNA Health Group, Inc. and RWJ Barnabas Health, that employs music therapists for the benefit of patients. Murray notes that the Music & Memory personalized music program provides another way for the joint venture to share the pleasures of music with more hospice patients and families. A chain reaction—that’s how one person’s joy, listening to musical favorites, can spread to people nearby. For those in the front lines of nursing home care, that positive energy can be transformative. 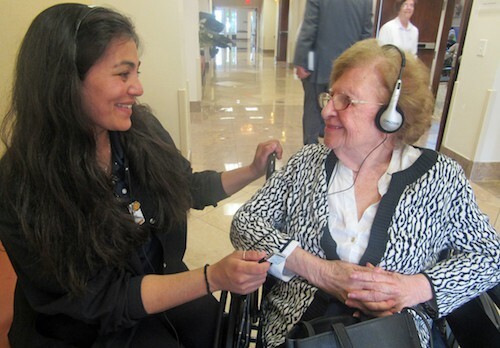 “When a resident puts those headphones on, there’s life,” says Olivia Emiko Thompson, a Certified Nursing Assistant (CNA) at MorseLife Health System in West Palm Beach, Florida. “They see you, they smile. The ones who can’t do ADLs (activities of daily living) for themselves are up and dancing. Close daily contact with residents place CNAs at the heart of a team effort to create a successful Music & Memory program. Not only do they witness the immediate benefits of personalized music, but also can play a key role in helping to identify which songs have the most positive impact. In addition, CNAs can observe and report when a resident would most benefit from listening to musical favorites—to help ease transitions, for example, or make dressing or bathing a more soothing activity. A personalized playlist can also be a magnet for community. 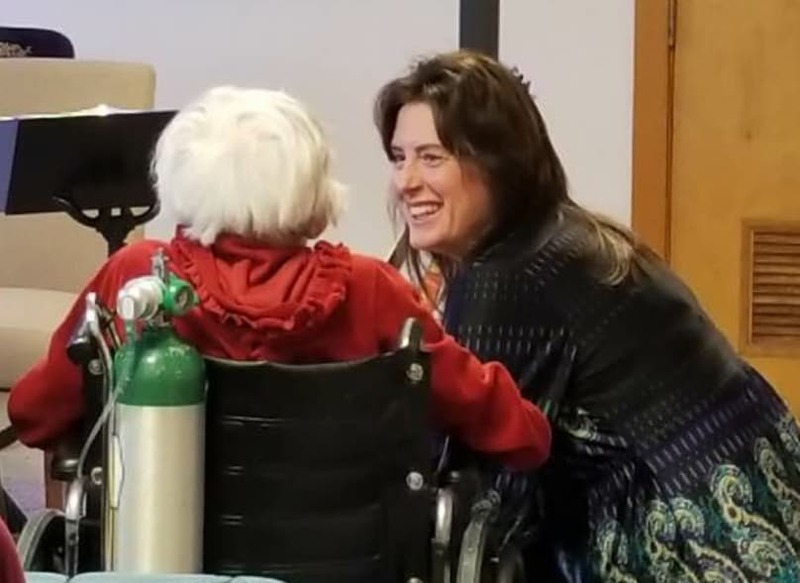 A resident with ALS, who couldn’t use her extremities and was confined to her bed and wheelchair, became the center of attention when Holway set her up with a playlist and an Amazon Echo that enabled her to use voice commands to listen to her favorite music and other media. In addition, he has created custom playlists for activities staff, religious services and common areas. The results are tangible: residents are more engaged, staff more productive and families appreciative about the positive atmosphere. When Jo listens to her favorite country music—Eddy Arnold, Hank Williams, Merle Haggard, Willie Nelson—she’s transported to another place. The 95-year-old resident of the Memory Care unit at Mary, Queen of Angels Assisted Living Community in Nashville, Tenn., is one of those people who makes an indelible impression as soon as you meet her. The fourth child of eight, Jo grew up on a farm. “She was the best cotton picker and hoer. Her dad was real proud of her,” says Marie, who has spent many hours getting to know Jo in the process of creating her personalized playlist. “Music takes her to a place where she can connect with her true essence,” says Marie. Volunteering as a Music & Memory Ambassador, she began calling area memory care units and delivering more than 100 copies of the documentary, which she purchased herself, all over town. About two months after she had spoken with staff at Mary, Queen of Angels, Marie got a call to meet with Executive Director Lyndsey Gower. By the end of the meeting, Music & Memory was a go. Once staff and Marie completed certification training, the memory care unit launched the Music & Memory program, with Marie as lead volunteer. Gower and Activities Director Tammy Marlin have been very supportive of the program. For Marie, there’s no question that Music & Memory is a powerful way to uplift the residents, tap into lost memories and build meaningful relationships. “I’m passionate about health and much prefer music over psychotropic meds,” she says. “This is just so powerful. I’m determined, in my own little way, to keep putting it out there and convincing other interested caregivers to try it. The 2017 Impact Report is here! We’re making great strides toward our vision of personalized music in all healthcare settings serving elders, and beyond – read our 2017 Impact Report to learn more. Do you have a gently used iPod that you no longer need? Help us spread the music and find your iPod a good home with someone like Henry. We are currently facing a shortage of $49 iPod Shuffles for patients with special needs. You can send us your used iPod or purchase a new one that will go directly to residents in a Music & Memory Certified Nursing Home.